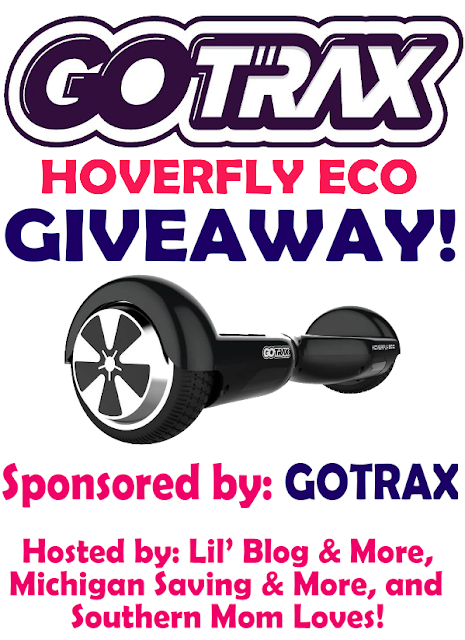 Welcome to the GoTrax Hoverfly Eco Hoverboard Giveaway!! First off, a huge huge thanks to GoTrax for sponsoring this giveaway, and offering up such a fun prize! This event is hosted by: Lil’ Blog and More, Michigan Saving and More, and Southern Mom Loves. If you have been wanting a hoverboard for a while, now is a great time to get one, from GoTrax. For Prime Day, GoTrax is offering 15% off of all GoTrax electric rideables on Amazon – And the offer is valid through July 21st! To get this deal, you can shop HERE, and input the code: 15mommyworks, at check out, to score some great savings! The GoTrax Hoverfly Eco Hoverboard is SO MUCH FUN! It looks intimidating, but it doesn’t take long, to start learning how to zip around on it. The price starts at $179.99, which, for a hoverboard, is an awesome deal. Even with the great price, this hoverboard is top of the line (Seriously, they have great reviews!) It’s so quick and easy to charge, and I am expecting years of fun with mine. If you are in the market for a new ride-on, GoTrax is the company to check out! How cool is the GoTrax Hoverfly?! I know my kids would love this Eco Hoverboard themselves. How about yours?! Who am I kidding? I would probably love one of these myself! But then on second thought, I probably wouldn’t be able to stay on it. My kids on the other hand would most likely figure it out before I ever do. Check out the percent off deal described above and go check it out. If you would like a chance to win one, be sure to enter the giveaway below! NOTE: This is not a DustinNikki Mommy of Three giveaway. We are only helping to promote this giveaway. All questions should be directed to the hosting blog as mentioned above.